That was a key verse in our Pastor’s message a few weeks ago. At least it was the key verse for me. I was struck by the phrase “Because the Lord says so, I will do it.” Doesn’t matter if I want to or not. Doesn’t matter if it’s morning and I’ve worked all night and I’m exhausted…or in my case, it’s evening and I’ve worked all day and I’m exhausted. Doesn’t matter if I’m discouraged because I’ve worked all day and haven’t made any money. Are you ready to be obedient when you hear God’s voice? I sure want to be. I know I have a predisposition toward it – my spirit and heart want to say “yes!” For me the challenge is more likely to be hearing God’s voice than saying “yes.” Because I can get caught up in what I’m doing and forget to listen. In order for me to be able to say as Peter did “Because you say so, Lord…” I have to listen – I have to hear God’s voice. Take a listen to Christafari’s song Listening. I’ve included the lyrics after the song. and that the world around will overtake me. as I stand alone and dream of you. Listening – For your light to shine the way through the darkest night (II Cor. 4: 6). Chorus: So I’m listening for Your voice to softly call my name. I’m listening for Your voice to help me on my way. sometimes He shouts more time He whispers. to find a way to a love I can only find in You, ya you. Listening – In moments, when I find it hard to hear you. Listening – I find the solution in your Word. I want you to listen the tear from my eye well shines and glistens. So I want you to listen and to listen cleanly. Somehow I think the voice Christafari’s listening for sounds a whole lot different from the voice I’m listening for! But it’s the same God. Each of us hears God’s voice differently, but the key is listening. Because sometimes He SHOUTS, but more time he whispers. So we have to be actively listening. Being aware that He wants to speak and listening for His voice. Ezekiel responded much as Peter did when He heard God’s instructions. In Ezekiel’s case, God gave him some pretty wild instructions. But because it was God who said so, Zek obeyed. Tomorrow we’ll look at Ezekiel listening to God’s voice and speaking it into reality. Stay tuned. My guess is that you’re planning your Thanksgiving weekend, and perhaps your holiday season. Don’t forget Jesus. Purposefully write in your calendar some time over the long Thanksgiving weekend during which you will sit with Jesus giving thanks. Use a small portion of that time to plan out times to spend with God during the month of December. Purpose to lay the world aside and spend time with the Jesus. Purpose to do the most important things this season, not just the urgent ones. While I strongly encourage you not to plan a full schedule of things to do during those times with the Lord, a simple plan can be a good thing. It can help you transition from full speed ahead in the world to peaceful worship and rest during your time with the Lord (without such a plan sometimes it feels like a crash landing instead of a spirit-led transition). Sometimes when we’ve rushed to our appointment with God it can be hard to settle into His presence. It can help you transition from servant to friend. If simply sitting at God’s feet isn’t something you do regularly, having a plan may help you adjust from a mode of serving God to enjoying Him. It can help you transition from purpose-driven thinking to presence thinking. If you’re like me, it’s easy to feel like you’re wasting time or being selfish when you are resting in His presence (forgive me, Lord). Having a plan gets me over the initial hump because I am doing something – I’m following my list of things to do. Don’t read this the wrong way. I’m not saying we approach our time with God as an item to check off our To-Do lists. What I’m saying is that having the basic plan helps me resist the feeling that I’m wasting time at the beginning of my time with the Lord. It helps me engage. Once I’ve engaged, I’m no longer working the plan, I’m enjoying God. Here are some ideas for your time with God. Don’t do all these things each time you meet Him. Plan the number of things you’re going to do according to the time you have. If I only had fifteen minutes, I would only do one, maybe two of these things. If I scheduled fifteen minutes every other day, I’d focus on different activities each time, cycling through them and then returning to those I found most helpful. Thanksgiving and praise – Scripture says that we “enter His gates with thanksgiving and His courts with praise” (Psalm 100:4). That’s what I want to do during my time with God – enter His inner sanctuary to meet with Him. Doing it His way only makes sense. Read Scripture meditatively – If fifteen minutes is all you have, spend ten of them on one or two verses. Pray it back to God. Ask Him to reveal Himself to you through the verse. Then sit and listen for His response. Express yourself creatively – Journal, paint, write a song or poem – Express yourself to God in some tangible way. It may feel awkward at first, but just go with it. He won’t be a critical judge of it any more than you were when your children drew their first picture of mom and dad. Enjoy your time with God during this Christmas season and I am confident that you will enjoy the season. People from many nations will come and say, “Come, let us go up to the mountain of the LORD, to the house of Jacob’s God. There he will teach us his ways, and we will walk in his paths.” For the LORD’s teaching will go out from Zion; his word will go out from Jerusalem. My husband Phil was reading Scripture recently and realized that as he was reading, he was thinking about how he would teach the passage – how it would be broken into sections, what points he would draw out, etc. I frequently find myself falling into the trap of reading through the lens of preaching – how the passage would be preached, what points should be drawn out, what illustrations might make the lesson more real to the listeners, etc. And then there are always the times we read Scripture just to meet our assigned reading for the day. Maybe you never do that, but there are times I realized that I’ve progressed quite far down the page without really having a clue what the topic is. We’ve stopped reading Scripture as a letter from God to us. God has something very special that He wants to speak to each of us each time we read His Word. He has taken great care to have His Word written and then preserved for thousands of years. The writing and preservation of Scripture is a miracle that we often overlook when considering miracles of God. If you ever have an opportunity to go through a good museum or display about the history of the Bible, it’s worth your time. We went through one at the Holy Land Experience in Orlando, FL. It was something I was doing for Phil (he’s more geeky than me)…or so I thought. I was surprised at how much I enjoyed it! God’s letters are as relevant for us today as they were to the audience for which they were originally written. Yet we often breeze through them or read them in a clinical or scholarly way. Sometimes scholarly is appropriate…so long as there are also times when we read Scripture as God’s letter to us. When Phil and I are about to have conversation, I “settle in.” I sit across from him, get comfortable, look him in the eyes and watch his face as I listen to his words. I get ready to enjoy him before he actually speaks. Our conversation might be about something as mundane as how his workday was or as meaningful as what God has been speaking to him during his devotional time with Him. Either way, I’m interested so I put myself in a place to pay attention and enjoy our interaction. I look forward to these times every day and miss them when our schedules don’t mesh enough to allow for them. Treating our times with God in a similar fashion will do wonders for our ability to hear from Him. “Settle in” before you begin to read. If possible, have a special place for meeting with God. It doesn’t have to be a place reserved only for Him – simply a place where you usually meet with Him. I sit in my recliner when I meet God on Saturday mornings. Because I do it almost every Saturday morning, I’ve had some really special times with God there. The chair holds memories with God for me. Now I also sit in that chair to watch television, but there’s a difference when I meet with God. I settle in with a cup of tea and a piece of toast. I start up my computer and I read and write and pray and worship. 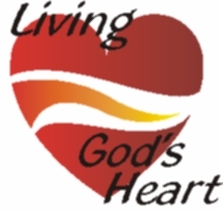 And God honors my time by sharing His heart with me as I do those things. I often wake Phil a few hours after I’ve gotten up with excitement about something I’ve read in God’s Word. 1In the last days, the mountain of the LORD’s house will be the highest of all — the most important place on earth. It will be raised above the other hills, and people from all over the world will stream there to worship. 2People from many nations will come and say, “Come, let us go up to the mountain of the LORD, to the house of Jacob’s God. There he will teach us his ways, and we will walk in his paths.” For the LORD’s teaching will go out from Zion; his word will go out from Jerusalem. We are in the last days. Let’s approach our time with the Lord with the enthusiasm the passage holds. When I read this passage, it sounds to me like they are preparing for a picnic with the King of Kings. They are gathering their things, climbing the highest mountain (but it’s a fun climb, a carefree climb, not a treachurous or arduous climb) to sit face to face with God talking about life. Read to enjoy God. He is the creator of the universe and He’s ready and waiting to have a conversation with you! From Discouragement to Faith – Ask God for His Strategy – Then Implement It! Let’s move on to the exciting, two-part fourth action. Faith Building Action 4 – Ask God for His Strategy – Then Implement It! Rest – If your discouragement came from overdoing, you need rest. If you’re a fan of the Bourne Trilogy by Robert Ludlum you’ll recognize the quote “Rest is a weapon.” It is a true statement. Becoming overtired or overworked, opens a door that the enemy loves to run through. Often, havoc comes into our life and in our condition of being overtired, we can’t stand against it and we become discouraged. So if you’ve just finished a season of extraordinary effort for the Kingdom (whether from obeying God or simply taken more than He required upon yourself), a period of rest may be the best strategy to return to full faith strength. Change – Sometimes discouragement comes simply because we’ve become bored with our routine. God can use such a time to nudge us into starting something new. Faith, by definition, means moving before we see God’s whole plan laid out before us. God’s strategy to rebuild your strength may be to point you in a new direction, giving you opportunities to trust Him. Experiencing the result of that trust builds your faith to trust Him more. Persevere – There are faith lessons to be learned when we are required to simply persevere – which basically means to gut it out! Merriam-Webster’s online dictionary defines persevere as “to persist in a state, enterprise, or undertaking in spite of counterinfluences, opposition, or discouragement.” Perseverance is defined as “continued effort to do or achieve something despite difficulties, failure, or opposition.” Despite failures, opposition and difficulties, sometimes we’re called simply to persevere. Paul speaks of persevering in many different ways, but most notably as finishing well. 6As for me, my life has already been poured out as an offering to God. The time of my death is near. 7I have fought the good fight, I have finished the race, and I have remained faithful. 8And now the prize awaits me—the crown of righteousness, which the Lord, the righteous Judge, will give me on the day of his return. Persevere, friends – a crown of righteousness awaits you! 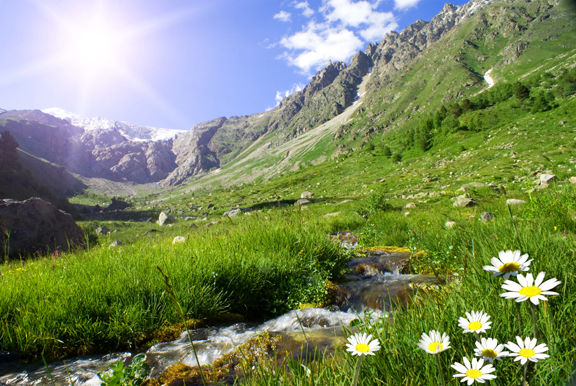 Seek healing in some other way – God’s plan for healing often takes us on a path to deal with past hurts and woundedness and He often uses others to help in our healing. His strategy for you might be to see a Christian counselor or sit under the teaching of a specific minister for a period of time or attend a specific conference. He might have you get involved in a small group outside your church. Or he may take you on a more personal journey to wholeness by having you write a book, create an art series or pursue one or more spiritual discipline more intentionally. Our God is a creative God and He knows you better than you know yourself. Seek God for His strategy during this time. Once you have a hint at the first step in His strategy, implement it! Don’t wait around until you have the whole plan. Many, many people get stuck in this stage of their healing. All that accomplishes is the prolonging of their discouragement. You won’t fully see God move in your life until you begin to move as He directs. To stagnate in the place of discouragement as you wait to hear new things from God puts you perilously close to becoming lukewarm. God is not pleased with those who are lukewarm (Revelation 3:16). So don’t get stuck – step out in faith! 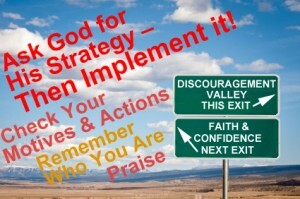 Comments Off on From Discouragement to Faith – Ask God for His Strategy – Then Implement It!